This chapter discusses how nonprofit organizations can plan and implement change. The focus is on the process that an organization can use to facilitate change. How can change implementers and change initiators work together as change agents to make change happen for the organization? To explain the process of actualizing change, the chapter offers a model that nonprofit organizations can use to make change happen. 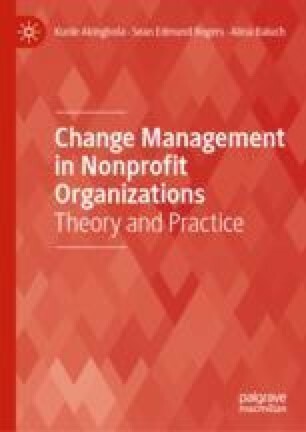 Since nonprofit organizations are unique in terms of their characteristics and processes, the model draws on relevant perspectives in organizational and nonprofit management theories to explain how to implement change in a nonprofit organization. First, the chapter briefly reviews two leading change management models and a comparison of change models. Ontario Nature. (2018‚ September 13). Missing: A Climate Change Plan for Ontario. Ontario Nature Staff Categories. Climate Change. https://ontarionature.org/missing-a-climate-change-plan-for-ontario/. Accessed November 15, 2018.